Non-reactive, non-adhering material reduces incidence of encrustation, urethritis, and stricture vs. latex. Color-coded inflation valve accepts luer lock and luer slip syringes. Packaged in an outer peel-back pouch and an easy-to-open inner sheath. What is the benefit of having a silicone Foley catheter versus a latex Foley catheter? The advantage is the silicone material. Silicone is biocompatible. It is non-reactive to human tissue. Silicone is inorganic which is man-made, inert, and contains no extractable chemicals or proteins. Latex is an organic material that also contains numerous extractable chemicals and proteins which act as a good source for bacterial growth. Silicone is non-adherent. It repels urine, water, blood, and most organic materials to reduce the incidence of bacterial attachment and growth. Silicone is non-porous so it does not absorb body fluids. It eliminates "Foley Catheter Expansion" whereas latex is porous (acts like a sponge). Silicone is also 100% latex-free. Do silicone coated latex Foley catheters share the same benefits of the DOVER™ 100% Silicone Foley catheter? No. 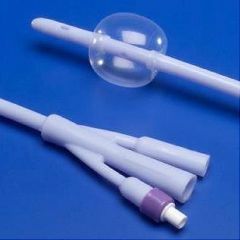 Silicone coated latex Foley catheters still utilize a latex platform and do not share the same benefits of a true, 100% silicone catheter (see above). Silicone coated catheters do not eliminate hypersensitivity concerns because they are still comprised of latex. Is silicone still considered stiff and uncomfortable? Silicone actually warms to the body's temperature and eventually molds to the shape of the urethra making it more flexible and comfortable. Just to let you know the credit was issued on my account. Thank you for your help and support.